Creative Close-ups: Abstract Abalone Shell Design! Moving in super close on a subject can be very cool and very colorful … and very intriguing, too! 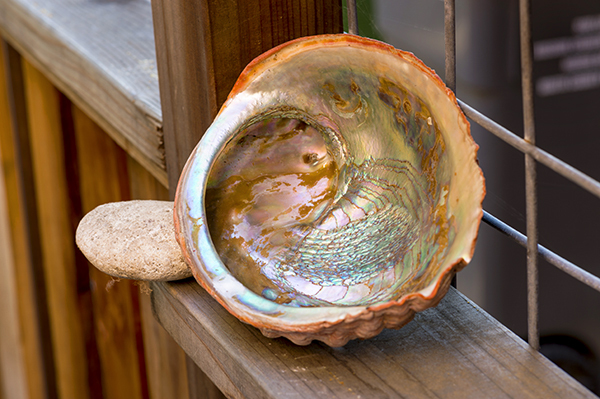 I found this excellent abalone shell at a coastal shop and quickly purchased it. At home, I placed the shell on a deck railing — with soft natural light from shade. And, with my DSLR camera and a macro lens, I photographed the shell’s abstract pattern of intricate details and bold colors. Above photo: Abalone Shell Design … Nikon D4 (full-frame DSLR). f/22 @ 1/8th second. 100 ISO. 105mm macro lens. Although the shell was mostly flat, there was still a curve to it, and with extreme close-ups, even a slight amount of depth is a factor! As a result, I chose the small aperture (f/22) in order to produce as much depth-of-field (front-to-back sharpness) as possible. As always with stationary scenes, I used a tripod in order to obtain maximum image quality and also to fine-tune the composition in order to get it just the way I wanted it (so no post-cropping needed). Below Photo: Here’s a quick snapshot that shows the overall scene. After shooting this, I used a macro lens to fill the frame with the colorful design. This entry was posted in Macro and tagged Creative Close-up. Bookmark the permalink.